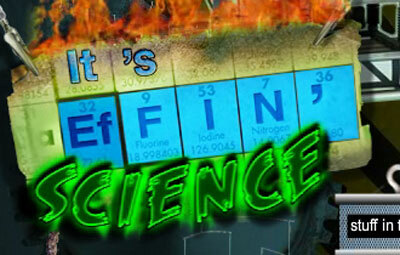 It’s Effin’ Science is Like Braniac on Caffeine! GearGuyd > Cool > It’s Effin’ Science is Like Braniac on Caffeine! Ever hear of “Braniac?” No? That’s okay. All you need to know is that it was crazy British science stunt show. Well, now we’ve got Effin’ Science, and it’s similar to Braniac but a bit cooler. In today’s episode, they launched a Porta-Potty dozens of feet into the air. With a model rocket. A model rocket with a sugar-fuel engine. That’s effin’ sweet! Of course I wouldn’t be a ToolGuyd if I didn’t take note of the tools they used on set. While showing off their rocket engine, a Hitachi cordless drill could be seen in the background. There was also a set of hole saws. What were they making holes in, the Porta-Potty?